Church shootings in Toronto, Ontario, Canada, and Knoxville, Tennessee, USA, have left ten injured and at least two people dead this weekend. A man walked into a Knoxville, Tennessee, church and opened fire Sunday, July 27, 2008, injuring 7 people, various local media have reported. The incident took place at the Tennessee Valley Unitarian Church at 10:15 a.m.
Church members said children from the congregation's summer theater workshop were performing a musical when the shooting occurred. A children's production of "Annie" was taking place at the time of the shooting. Steve Drevik, a church member, described the shooter as a man with long blond hair, who appeared to be in his 40s. He said he walked into the sanctuary and opened fire with a shotgun, shooting indiscriminately. No children are believed to have been hit by the gunfire. Seven people were transported to an area hospital. The extent of their injuries is unknown. The alleged shooter is in custody. Update: A man died in Sunday's church massacre in Tennessee when he stood in front of a gunman who fired on congregation members, a witness said. Greg McKendry was the only immediate death in the incident at the Tennessee Valley Unitarian Universalist Church, the Knoxville (Tenn.) News Sentinel reported. Capt. Brent Seymour, a spokesman for the Knoxville Fire Department, said police had a suspect in custody, CNN reported. Knoxville's WBIR-TV reported only six of the injured individuals suffered gunshot wounds in the attack. The seventh injury victim only suffered an ankle injury, the TV station said. The TV station added that no children were thought to have been hurt and two of the hospitalized victims may be serious condition. Knoxville's WVLT-TV said the gunman may have been restrained by members of the congregation following the shooting spree. Meanwhile, on Saturday, July 26, 2008, three men were injured in a church shooting in Canada. Early Saturday morning, Toronto woke up to a murder in the least likely of places: church property. Devon Wynter, 40, was found dead in a hall underneath the Disciples Revival Church. He was pronounced dead in hospital. Two other men were also injured in the crossfire. One was hit by a stray bullet. The other hurt himself as he raced from the scene. The wound on his leg, believed to be a cut from a piece of glass, was so severe he thought he had been shot. Both men are expected to be fine. Sunday church services are going ahead as usual. Cops have combed the area for clues, lifting fingerprints from the door and even searching a nearby stream. Police say many of the 500 witnesses on scene (a dance was occurring) have been cooperative. If you have information that could help their investigation, give them a call. Three people were wounded when a gunman opened fire at a Phoenix, Arizona, community college on Thursday afternoon, July 24, 2008. Police speculate that the shooting stems from a longtime dispute between the suspect and a student. Investigators say the suspect, who is a former student, shot three people in a computer room at South Mountain Community College. One of the victims was seriously injured and remains in critical condition on Friday. Police arrested Rodney Smith, 22, nearby after he flew the scene to a nearby home. Witnesses say the suspect and student had a verbal confrontation shortly before the shooting. Two people were struck by stray bullets and are in stable condition at Maricopa Medical Center. The third victim, who reportedly was the suspect's target, suffered a shot to the leg and is listed in critical condition. There appears to be another copycat murder due to the motion picture, Natural Born Killers. Eric Tavulares was fascinated with the movie Natural Born Killers. He told police he has seen it 10 or 20 times. He told police, according to a complaint filed Monday, July 21, 2008, that he had been watching it Friday night, July 18, the night he strangled his childhood sweetheart, 18-year-old Lauren Aljubouri. According to the complaint: Tavulares, also 18, told police he has had known Aljubouri since the second grade and that they had been dating on and off since the sixth grade. Aljubouri, who graduated in January from Arrowhead High School in Waukesha County, got home around 10:45 p.m. Friday. She and Tavulares lived in an apartment in the 2400 block of N. Frederick Ave., not far from the University of Wisconsin-Milwaukee, where Aljubouri planned to study graphic design. Tavulares planned to study fire science at Milwaukee Area Technical College. Tavulares told police they began watching Natural Born Killers, a 1994 movie directed by Oliver Stone in which the murder spree of two psychopathic lovers becomes a media obsession. They stopped the movie about halfway, Tavulares said, and went to bed. Within three or four minutes, Tavulares said, Aljubouri was dead. Debbie Aljubouri said her daughter was independent, driven and intelligent, determined to pursue her passion for the arts at UWM. Lauren Aljubouri had worked at Hartbrook Cafe in Hartland from the time she was 15 until June, painting a mural at the business just before she finished working there, her mother said. Lauren Aljubouri graduated early and with honors from her high school, she said. Lauren Aljubouri handled her search for colleges on her own, telling her mother that all she needed to do was attend the registration session at UWM, Debbie Aljubouri said. Lauren Aljubouri moved into her apartment within the past few weeks, her mother said. She had worked at Umami Moto, a Milwaukee restaurant, for about a month, said Omar Shaikh, an owner of the business. Lauren Aljubouri and Tavulares had been dating steadily for the past few years, Debbie Aljubouri said. Tavulares has convictions for resisting or obstructing an officer, possession of an illegally obtained prescription drug and bail jumping, according to online court records. Tavulares told police that when he realized Lauren Aljubouri was dead, he jumped off her and attempted to resuscitate her. A police officer arrived at their apartment shortly after 3 a.m. Saturday. “I did it,” he told the officer, according to the complaint. “I can’t believe it. I did it,” he said. Lauren Aljubouri was pronounced dead at the scene. Tavulares is charged with first-degree reckless homicide. He faces up to 60 years in prison. Debbie Aljubouri said she was upset Tavulares was not charged with first-degree intentional homicide. “I don’t understand this,” she said. Source: "‘Natural Born Killers’ fan charged with strangling girlfriend," by Crocker Stephenson and Ryan Haggerty, Milwaukee Journal Sentinel, Milwaukee, Wisconsin, July 22, 2008. There is something sinister happening in Fayetteville, North Carolina. Women soldiers are being killed. Young women are being stalked. There is a copycat about. In that town's Fairfield Inn, in the room where Spc. Megan Lynn Touma’s body was discovered June 21, 2008, a killer watched. 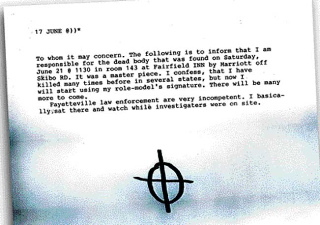 He went purposefully about his killing in that North Carolina hotel room, and then scrawled the "Zodiac Symbol," like that of the infamous Zodiac Killer, upon the room's mirror, according to local police. He is calling himself, by his actions and his symbol, Zodiac. The sign he used to inscribe the letter he sent to the press reminds us, of course, of the Zodiac of the 1960s. The choice of the date, the Summer Solstice, may be part of his plan for attention. Perhaps even the location, Fayetteville, was picked on purpose. The name game. The copycat effect. You've read of both of them here. Below is the note. More later.